Daizy peeked into the open doorway and walked right in. She sniffed around a bit, picking up the scent of candy set on a table just out of reach from her black nose. Her attention was pulled away from the sweet temptation when Elaine Kresha took a seat in the recliner in her room at The Heritage at Meridian Gardens. Owner Jen Hill called Daizy, and the dog trotted over and sat, ready for the attention Kresha was about to give her. I love animals. They love to be loved, Kresha said as she stroked the canines brown fur. Daizy is a frequent visitor to those in the memory support unit at Meridian Gardens. The 7-year-old dog often comes with Hill on her daily visits to see her mother, Carol Rossi, who is a resident there. The 70-pound Lab and pit bull mix is welcomed into the community, often earning a scratch behind the ear from those passing by or treats such as apple slices from those hanging out in the dining room. The road to becoming a therapy dog want exactly a path Hill saw for her four-legged friend when she adopted her in 2010 from Erna R. Badstieber Paws and Claws Adoption Center. Hillís daughter, Izzy, picked out Daizy from a cast of several other dogs. Daizy was the only dog that wasn't barking. All the other dogs were jumping. Daizy was just there being polite,î the 9-year-old girl said. The mild behavior Daizy showed in her kennel changed when the family took her home. She was pretty wild, Hill said. That explained why Daizy had been in and out of homes several times before the Hills took a chance on her. Daizy especially acted up when she was outside. One time she grabbed Izzy by her hooded sweatshirt and pulled her around the backyard. Another time she knocked the young girl down, causing Izzy to hit her head. ìI thought that was it. We are done,î Hill said. At that point, they had Daizy for about three weeks and started to bond with her, so they tried obedience training. Daizy responded to the training right away. It went so well that Hill was able to bring Daizy to Meridian Gardens to visit her mom. 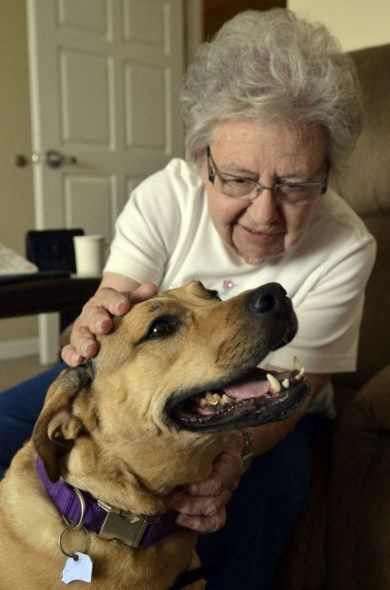 She also began to consider making her a therapy dog because of the positive effect she saw among the residents. ìIt just brought people joy,î Hill said. Kim Valish, memory support director at Meridian Gardens, said the residents lighten up whenever Daizy is around. For some, seeing Daizy helps bring back memories of their own childhood pets. The canine also provides a comforting, soothing presence. People with high anxiety, it just melts away when they see her. They get really calm when the dog comes in, Valish said. Daizy went through the process of becoming certified through Healing Hearts Therapy Dogs Inc. in Lincoln. She officially earned her American Kennel Club Canine Good Citizen certification in February. She passed with flying colors. She was awesome,î Hill said. Meridian Gardens isn't the only place where Daizy uses her therapy skills. The dog has also visited Center for Survivors to work with children. Hill is sometimes accompanied by her daughter while taking Daizy on her therapy duties and hopes the experience teaches the young girl about responsibility and kindness. Daizy may not have acted like a therapy dog early on, but the transition is working out well for everyone involved. That is evident by watching the canine walk down the hall at Meridian Gardens, where she was greeted by one resident. Oh, look at you. You look beautiful, Thala Hasselbalch said as she stopped to look at Daisy. The dog stood still, letting the elderly woman pet her. Click here to read the article in the Columbus Telegram.